Cacao, Chia & Blueberry Raw Bliss Balls, a high energy snack made from nutrient-rich nuts, seeds, dried fruits and superfoods. An ideal breakfast on-the-go, post-workout snack or lunch box treat for kids and adults alike. The Bondi Kitchen produces naturally delicious, healthy Bliss Balls inspired by the active, outdoor lifestyle that is so closely linked with Bondi beach, the founder's Australian home. Their Bliss Balls are made purely from plant-based ingredients and are free from wheat, gluten, dairy and refined sugars. Available to buy in quantities of 4 Packs (42g each). Each pouch contains four Bliss Balls, with a zip to reseal. Best kept in a cool, dry place. 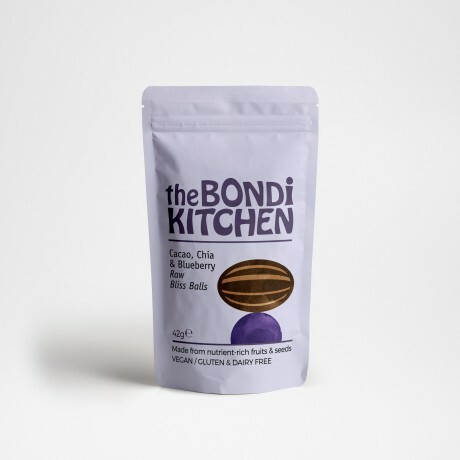 Dates, cashews, almonds, organic mulberries, coconut, organic chia seeds, raw cacao, freeze-dried blueberry powder, natural blueberry flavour, green tea extract. Produced in an environment that handles nuts, peanuts, and sesame seeds. May contain date pits. Gluten-, dairy-, added sugar-free 100% raw bliss balls, a high energy snack.